With the 9.7 release there is a brand new navigation configuration tool, we heard a lot about the original configuration tool (v.9.3) and the updated HTML Editor (v9.4 Onwards) and many of you expressed a need for a super simple way to edit / add & remove links from the top level navigation. We even added a ‘custom link’ ability so you can easily link any navigation link to a URL of your choice – it really couldn’t be easier. *By the way, the HTML Editor is still there but is now labeled as a CSS editor, you can find it under Site Content > Css Editor. Drag and drop ordering, hover, click and move these items around as you see fit. What do you want the link the navigation to actually say? Perhaps you would rather ‘Companies’ instead of the word ‘Listings’, just tap in your new text here. All modules in eDirectory have their links hard coded (the module links can not be changed), but if you’re linking to a module just select it from here. If however you wish to add you’re own link pointing to another page, another site or anywhere else that’s not a module, choose the ‘Custom Link’ option. Pretty self explanatory, press this and the row is removed. You can also pick from the Header or the Footer navigation, and if you check the bottom of the table you’ll find a super handy ‘Add Row’ button. I hope you like the new navigation tool, and our move towards a more streamlined approach. With the release of 9.7 comes a brand new language center. Pick the language of both the site (front-end) and the sitemgr (admin) independently for any domains or subdomains you own and run eDirectory on – it really couldn’t be any simpler – did you mention you can edit every single piece of the language integration? *Language switching on demodirectory.com will return shortly. From an SEO standpoint, having all of the data criss-crossed across 7 pages (one for each language and translation) turned out to be a bit of a nightmare. By splitting websites into subdomains or indeed entirely different domains they retain a great deal more of their rank (multiple pages are not considered duplicate content anymore), the content is individual, the sites are unique, and if you are writing you’re site in Spanish or Portuguese, surely it’s better for you to host that site with the correct TLD (Top Level Domain) – .com.br & .com.es respectively. Simply login into the sitemgr and head to the ‘Language Center’, and on the first tab select both the language for the main site (Front End) and the language for the back end (Sitemgr), that’s it you’re done, these settings can be changed as often as you want or need. eDirectory requires two language files to function correctly, they can both be downloaded here, simple select the language and section you wish to edit (Sitemgr or Front End), then hit the ‘Download Language File’ button. Edit on your computer until you have the file the way you want, then simple return to this screen and upload – job done. 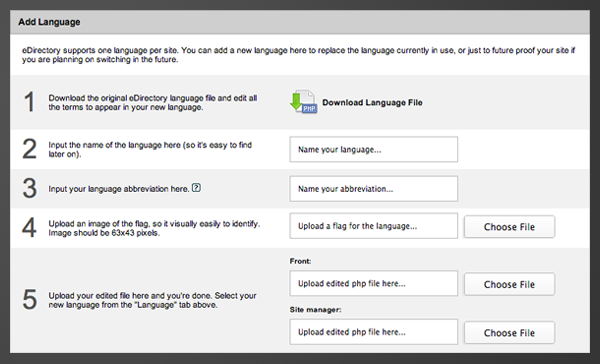 A lot of site users ask for a really easy way to edit the language data – this is it. So, eDirectory doesn’t support a language you want? Not a problem, all the tools are here for you to add you very own language (providing you do the translation of course). Head off to the ‘Add Language’ page and simply follow the 5 steps for creation of a new language, tap in a few bits of information and the language is instantly available for use – we love it. You know how it is, you make a change, upload a language and then find out you used the wrong flag or even worse names the language incorrectly – open the ‘Name & Flag’ tab in the site manager area and edit these oh’ so important settings here. We hope you like the new language center, it’s really a much better way to organise the languages, it’s simple, clean and easy to use. eDirectory has released version 9.5, and with it, a significant restructuring of the base code in order to develop a more robust platform to build upon in the future. While users won’t notice many changes in the layout or appearance of the sites in version 9.5, the eDirectory base code team, under the leadership of recently appointed Product Manager, Darren Cornwell, has made a multitude of changes in the way the code is structured. Notably, the import tool has been completely redesigned to be a bit more effective and seemless upload process. Imports are now limited to 100mb or 100,000 lines. With only a single file able to import at a time, the system will see significant performance improvements in a shared environment. “With the new release of 9.5, eDirectory is now considerably faster. The basecode has undergone major rewrites in various sections, there is now the addition of a new import / exporter which makes updating and retrieving data much easier, based on customer feedback. In addition to these, there are a whole host of tiny fixes and updates which serve to continue to keep eDirectory as the leader in the online directory space,” said Product Manager, Darren Cornwell. Additionally, the blog has seen several updates to it in 9.5 You can now add banners to the blog, through an ‘Add to Blog” module in the banners section, as well as have the ability to feature and disable categories as well as add subcategories to blog categories. For SEO purposes, the sitemgr now has the ability to change settings regarding SEO on blog components. Like the blog module, the Deals section also saw a few notable changes. Site owners can now show recent reviews on both the deals home page and deals results page and like the blog, site owners can now add banners to the deals section. Lastly you can now access traffic reports from deals section, as well as pull statistical reports. Annandale, Virginia – May 16th, 2012 – Arca Solutions, the parent company of eDirectory.com, has launched version 9.3, which introduces new a variety of new features and capabilities in the basecode of the software. Version 9.3 was concentrated mostly on a number of smaller, but impactful features, mostly those suggested by the customer base. One of the more notable aspects of 9.3 is a new real estate template, which can be used for those trying to create a real estate listing-driven site to showcase properties. The direction of future releases may be concentrated more on creating niche, vertical focused ‘templates’ that work off of the base code, but each offering a different set of features that are most pertinent to their respective focus. For instance, the gallery on the details page uses a slider as opposed to a popup window and the template as a whole only uses the listings, blog and banner modules. “The Real Estate theme is the first of many beautiful, stylish new directory themes to come. This release makes eDirectory the best solution on the market for creating a professional grade, multilingual real estate site,” said Arca Solutions CEO James Chubb. 9.3 also offers category sitemaps, meaning users can now generate category sitemaps for all languages. Other additions include an email import notification, the date selection tool now supports all languages in the system and the listings section within the site manager has been tweaked to preview listings more easily. Lastly, an RSS feed has been added to the deals module and the advertising page has been restructured to support both graphical themes as well as the newly released real estate theme. To learn more about these features, please contact a sales representative by calling (703) 914-0770.
eDirectory is a division of Arca Solutions, Inc, a digital media company headquartered in the Washington, DC metro area. Annandale, Virginia – August 5th, 2011 – In their second software release in less than a year, Arca Solutions, the parent company of eDirectory.com, has unveiled version 9.0, which introduces new features such as Click to Call, SMS listings to others, Sugar CRM Integration, Google + enabled sites and more. Unlike most other releases, version 9 concentrated on small, but impactful features to the base code that help site owners sell the functionality of their directories a bit more. With Click to Call, site visitors can click on a listing, enter their phone number, and upon clicking enter, will be placing a call to the business. Accordingly, the ‘Send SMS to Phone’ feature will enable visitors to send contents of that listing via a text message, including the business address, phone and listing link. Both features, however require an account with Twilio, who provides very affordable levels of web API services. Based on the request of their customers, the eDirectory.com basecode team included an integration with SugarCRM in version 9, where sales reps can automatically populate orders from eDirectory into their Sugar account. With the popularity of Google +, visitors will also be able to share listings with others. “I’m really excited about the work we did under the hood, completely overhauling the CSS to make it much easier to customize as well as taking measure to improve the SEO of our users’ sites,” commented CEO James Chubb regarding release. 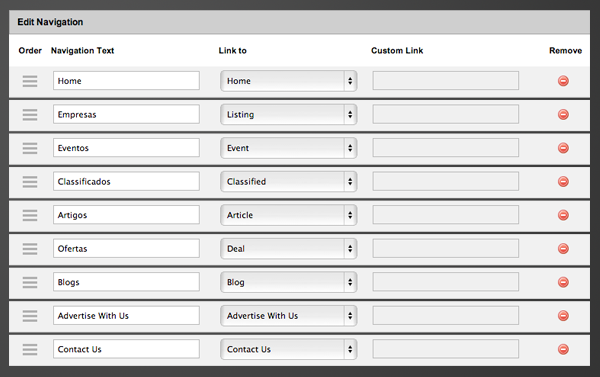 The Back Link Builder incentivizes listing owners to link back to your directory with increased visibility. In short, when a listing owner links to their directory, the software will verify the link and increase the exposure of their listing in the directory. Other SEO changes to the software include now having a description field available for categories, where site owners can add in SEO friendly text. Lastly, all listing images are now tagged for Google Images, increasing your directory’s presence on the search engine. A few final features changes include overhauled CSS to simplify customizations, entirely redesigned mobile html versions to look even better on more hand helds, in addition to overhauling the URL structure for multi-lingual sites. To learn more about these features, please contact a sales representative by calling (703) 914-0770. Annandale, Virginia – April 15th, 2011 – Following up the most paramount release since launching the product 7 years ago, eDirectory, the leading online directory software solution, has announced the release of version 8.1, which features new functionality in both the iPhone and Android, in addition to a revamped import tool, SEO-friendly URL structures, new language support and more. Following up on the blockbuster release of version 8.0, which included multi-domain management, a revampled deals section (previously coupons), iPhone and Android feature updates, Package builder and GEOIP, the eDirectory basecode team focused their development efforts more on growing and improving existing features of the system as opposed to adding a slew of new functionality as they had in version 8.0. Perhaps the most notable change for existing users is a revamped import too, which includes a brand new interface, new import types and the ability to update listings, too. Additionally, version 8.1 will have a few improvements on the SEO of the software, specifically creating more SEO-friendly URL structures across the site, specifically those pulled from search queries within the database. Furthermore, eDirectory will have W3C validation to ensure all directory sites are crawled error-free. Another notable feature based on demand is having Turkish language available for translation in the top corner of each site. The platform already provides a Spanish, French, Italian, English, German and Portuguese translations. Site owners can now provide category descriptions when visitors click on a category in order to better explain how the site is organized. The deals section will not only provide discounts by dollar value, but also by percentage of the cost, and user profiles now include a few new fields, all in addition to several other minor changes and fixes made to the platform. eDirectory has recently launched “eDirectory for iPhone” to help site owners create yet another way to generate traffic and ad revenue by publishing sites directly to the iPhone, who currently holds over 21 million users. “Today there are an estimated 21 million iPhone users, and a private label iPhone application is a great addition to the eDirectory product line. The additional traffic generated through the iPhone apps will be a valuable asset to eDirectory site owners,” said eDirectory CEO, James Chubb. To learn more about eDirectory for the iPhone, go to the eDirectory website https://www.edirectory.com/mobile/ or call us directly at (703) 914-0770 x1. Annandale, Virginia – November 18th, 2010 – In their most paramount release since launching the product 7 years ago, eDirectory, the leading online directory software solution, has announced the release of Version 8.0. The most recently version will see a widely robust feature set that includes multi-site management, mobile check ins, a new Android app, package builder, deals engine, GEO IP and more. Version 8 quickly addressed a long standing issue many directory site owners faced; Managing multiple domains with both ease and affordability.eDirectory’s new Multi-core feature will allow users to add domains on the fly, manage multiple sites within one Content Management System, and up-sell your advertisers for sponsorships across all of your sites. For example, when an advertiser goes to purchase a sponsorship on your Chicago Pizzeria directory, the site owner can present that advertiser with the opportunity to also advertise on their Chicago Nightlife directory at a discounted rated. Along those lines, version 8 also includes a Package Builder feature, giving site owners the ability to develop bundled or packaged sponsorships where advertisers can purchase a mix of listings, banners, events, classifieds or articles. With the release of eDirectory for the iPhone nearly a year ago, there has been a significant investment in the company’s mobile development team, adding an Android app in the new version. Now coined ‘eDirectory mobile’ to house both brands, the organization’s mobile team is pushing to keep their Android app features at par with their more developed, longer standing iPhone App. The iPhone now has mobile check ins and reviews, which while currently not in the Android framework, will be expected to follow in the months to come. Another significant addition to the features within the system is the Deals Engine. Previously referred to as “coupons” within the site manager, the revamped Deals Engine will allow listing owners to create a “deal” or limited time discount on their products or services, which can then be posted and claimed through Facebook. “eDirectory v8 is a pivotal release, with the ability to run multiple sites under one CMS, up-sell advertisers, a new Android app platform, iPhone-Facebook check-ins, a revamped Deals Engine, and too many smaller improvements to name. Site owners using eDirectory v8 will quickly generate more page-views and revenue than ever before.” says eDirectory CEO, James Chubb. Other features that round out the release include a WYSIWYG navbar and footer interface on the site manager, giving site owner’s the opportunity to change the elements in these areas, previously not available. GEO IP will pre-load the location of visitors who come to directory sites, adding personalization to the user experience. Annandale, Virginia – June 30th, 2010 – Just two months after its’ most recent release, eDirectory, the Leading Online Directory Software Solution, will be releasing its’ newest version, 7.5 and a .net platform of the system along with it. With one if it’s quickest back to back releases in company history, eDirectory 7.5 will showcase new blockbuster features such as the integrated blog tool, visitor registration and visitor profiles. While eDirectory can still be integrated with wordpress and other external blogging systems, the most recent version has added a fully integrated blog tool that has most features available in bloging platforms. Visitor can now register through the system and create user profiles to create a basic community for their sponsors and members. Members and sponsors can add reviews and create users profiles, and sponsors can share their listings, articles and other elements through Facebook. “7.5 is a significant release for eDirectory. The visitor profiles and blog feature will go a long way to engaging traffic and building a successful directory site.” says eDirectory CEO, James Chubb. Uploading images into your content has become significantly easier as they can now be imported with a new tool on WYSIWYG editor. Upload and create thumbnails of those images and setting your main images are now tasks that can be completed in a centralized location where you add listings.. Restrictions on both listings and categories have also been lifted as now you can have an unlimited number of categories with listings, and categories with an unlimited amount of levels. Annandale, Virginia – June 11th, 2010 – After a year long initiative to open up its’ platform to cater to more development arenas, eDirectory has announced the release of it’s .net version of the software. While the original version was developed in, and since refined in PHP, the staff has recognized the importance to create a version of the system that can cater to more developers who are accustomed to a Microsoft enivronment. “While it hasn’t been extremely detrimental to the growth of the software, we realized that the PHP platform was restricting to those more comfortable with, or used to developing in a Microsoft environment. As a company with a diverse backgrounds in software development, we appreciate the value of a system that can appeal to more than one platform” says eDirectory CEO, James Chubb. Because eDirectory’s base code team has been so aggressive in releasing new features in the PHP version of the software in both 7.4 and 7.5, the .Net version will be contain all of the features through version 7.3. The most notable features not available in the .net version are the series of new graphical templates released in 7.4, the visitor login and profile creation, as well as Site Manager interface upgrades, access to a few payment gateways and other minor changes. Because version 7.4 was launched a little over two months ago, the .Net version of the system (7.3) will be as high, if not higher than a majority of all users.